Governor Rochas Okorocha of Imo has formally declared his intention to contest the Orlu senatorial seat in the 2019 elections on the platform of All Progressives Congress (APC). A statement signed by his Chief Press Secretary, Sam Onwuemeodo, revealed that the governor made the declaration before leaders and stakeholders of Orlu, who paid him a courtesy visit at his office in Owerri. Okorocha noting that said he needed no campaign posters, said the success story of his administration’s free education programme in the state as well as over one thousand verifiable projects to his credit as governor, would win him the seat at the Senate. 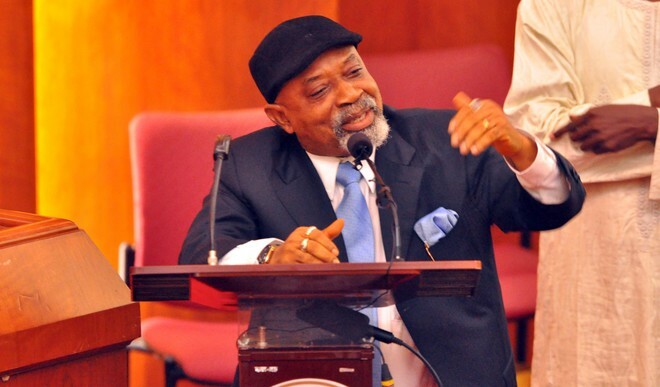 Minister of Labour and Employment, Dr Chris Ngige, on Sunday, said the Buhari’s administration had created over eight million jobs through agriculture and allied industries, adding that no government would have done better than the present government in the areas of security and the economy. The Minister who expressed this while speaking with journalists in Onitsha, Anambra, said Nigeria would have been in ruins by now if President Buhari was not at the helm of affairs, stressing that the All Progressives Congress met the country in tatters when it took over from the Peoples Democratic Party about three years ago. “We came in and oil nosedived to $37 a barrel with a production of 600,000 barrels per day, a drop from 2.2 million and yet we managed the economy out of recession. “Nigerians should be clapping for us on a daily basis, and after thanking God, they should thank us. Yes, because God has used Buhari and some of us to make Nigeria work,” Ngige said. The All Progressives Congress (APC) has reacted to the statements by Rivers Governor, Nyesom Wike, that the ruling party is allegedly sponsoring certain presidential aspirants vying for the People’s Democratic Party (PDP) ticket, challenging him to name them. APC spokesperson, Yekini Nabena, in reacting to the statement, said Mr Wike’s statement is another sign of the PDP’s despair over its “failed” 2019 election bid, as he urged the opposition party to quickly wake up to what it called the reality that the 2019 presidential elections have been won and lost. “Instead of putting its house in order, it is laughable that Governor Wike and his PDP cohorts are clutching on straws in their desperate bid to remain in public reckoning, in the face of imminent 2019 defeat” the statement read. The Presidency has on Sunday debunked reports that beneficiaries of the Federal Government Trademoni, N10,000 collateral free loan had to present their Permanent Voters Cards (PVC) as a qualification for the loan. Media aide to the Vice President, Laolu Akande who made the explanation while giving an update on the scheme, said that there was no documentation of any kind was required before one is qualified for the loan, adding that those who question the timing of the loans have forgotten that the credit scheme was part of the Social Investment Programme of the Buhari presidency which commenced in 2016. “Must we then suspend the empowerment of the traders just because some people will insinuate motivations? “The petty traders whose trades and lives are being positively impacted as they receive the N10,000 are telling a different story from those making political insinuations. And it is their stories that inspire us,” he said. The National Emergency Management Agency (NEMA) has expressed concerns about an impending flood disaster in Kogi, that may be worse than the 2012 experience which led to the displacement of many residents after the River Niger overflowed its banks. Director of Planning, Research and Forecasting at the agency, Vincent Owan, who disclosed this during a visit by NEMA to the state, to assess the extent of the impending flood disaster, advised residents on the flood plains to immediately relocate to the upland areas or to the Internally Displaced Persons (IDP) camp at the flood estate built. “My first impression is that the flood situation is quite devastating for the fact that all the indices that manifested in the 2012 flood disaster are here, except for the release of water from the Lagdo Dam,” he said. Executive Secretary of the Kogi State Emergency Management Agency, Alhasan Ayegba, also said the water level has risen to 10.30 meters, is already beyond the normal levels.